The Samburu Project is again coordinating a Walk for Water, and is supported by many members of our Woodside community including Bob and Martha Falkenberg and Matt and Doretta Bonner. Please come join us for a Saturday morning (April 21st) hike in the woods! Brunch will be served afterwards at Alice’s Restaurant. This hike is in support of The Samburu Project which, with Woodside’s support over the years, has drilled 100 fresh water wells serving over 100,000 people in Kenya! Once these drought-stricken communities have access to water, women no longer spend six hours a day walking for water, school attendance for girls more than doubles, and water-borne diseases (common in these communities) all but disappear. Our goal for the Woodside Hike is to raise $10,000 to help The Samburu Project maintain these 100 wells and expand the services in these communities that empower women to work and girls to gain education. Register and donate here. The Woodside Wildebeests is a new youth track and x-country USATF club designed primarily for middle school kids, grades 5th-8th whose goal is to provide youth with an introductory foundation to track and field and x-country running, while simultaneously avoiding burn-out and setting them up to continue developing through high school and even college. Learn more here or come to one of the two upcoming Woodside Twilight Series track meets being held at Woodside High School (May 1 and May 29, 2018). You might even run into The Village Doctor who is providing pediatric and sports-oriented acupuncture and massage therapy support. The Woodside Soapbox Derby returns for its SIXTH year! New and Improved! And we’re delighted to be sponsors again. Check out all the info here. 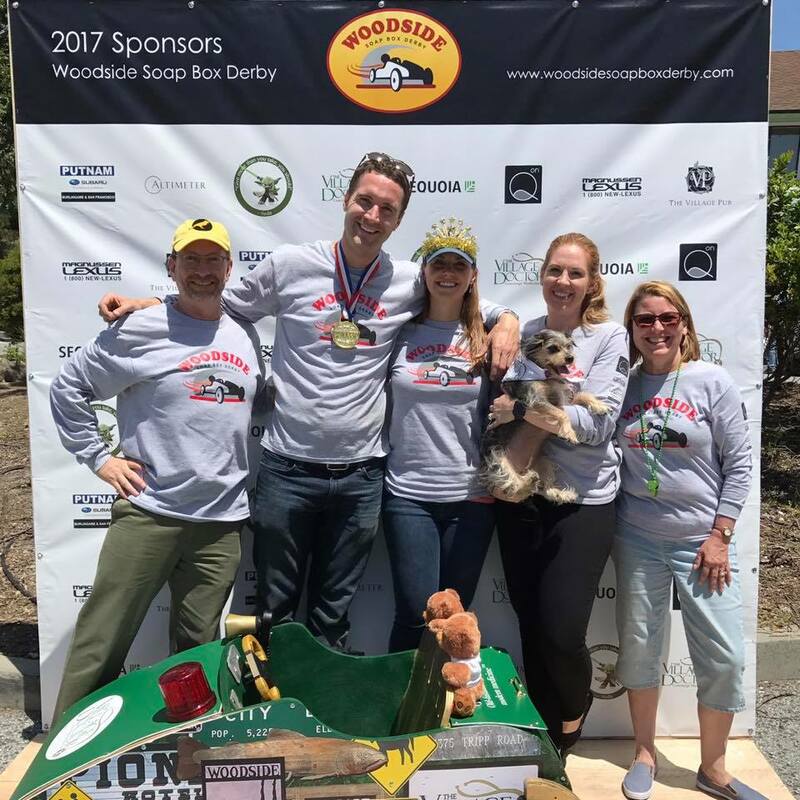 Don’t miss out on the fun (and the T-shirts) on Sunday, May 6th, 2018 and if you ask nicely (and are of the appropriate size) we might even let you drive our “TARC” (tiny awesome race car). Zoom Zoom!